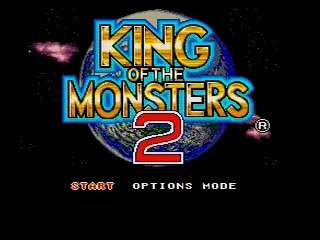 Released in 1993, King of the Monsters 2 is the sequel to the terrible game that is King of the Monsters. In this game you take control of one of three monsters as they try to stop an alien invasion while carelessly destroying various cities that were supposed to be saved. Best Time with Cyber Woo, Normal Difficulty: 0:20:01 by Jay 'DeMoNFLiP84' Cabasag on 2014-03-05. Best Time with Cyber Woo, Hard Difficulty: 0:19:18 by Jay 'DeMoNFLiP84' Cabasag on 2015-03-18. Cyber Woo is the best monster to speed run in this game! Cyber Woo's Woocopter ability does the most damage out of the other monsters in the game. In comparison to the NEO GEO version, the duration of the Woocopter ability last longer and does an insane amount of damage in the SNES version. There is a few key strats when doing a speed run with Cyber Woo. 1.) Doing knock downs during the boss fights is key to winning battles quickly. It buys you some time to charge up your power meter and then unleashing the Woocopter ability on the boss to hurt them. Only downside to this ability is that Cyber Woo can get stun easily in the battle. 2.) Also trying to avoid the bosses from engaging grappling battles. Grappling with them takes some time away and it's totally RNG on who wins the grapple battle so it's not worth confronting them. On a side note, Harder bosses have a higher chance of winning those grapple battles. 3.) Jumping on top of Life& Powerup drops cancels out the "celebration" animation upon picking them up. Now with that said let's get on with the details of this run. Most of these levels are short and going through a few waves of enemies before battling the boss of the level. Battle 1: America City - Huge Frogger is a very aggressive boss. He likes to teleport and jumps around. Occasionally he tries to sneak in an attack to take you down. He was soon put away. Battle 2: French City – Eifflelyte is another aggressive boss. He tried to put up a fight but he was soon put away as well. Battle 3: Grand Canyon – Crawhead is a tough boss. He tries to keep his distance away from me but to no avail. Battle 4: Dessert – Beetle Master actually put up a fight here. But even that didn't stop me. Not even the tiny brain insect. Battle 5: Sea Bed – Sack Eyes is a tough boss. His attacks are kind of unpredictable. He had me mashing buttons but I managed to get through it. Battle 6: Lava Zone – Lavicus is a very tough and aggressive boss. He likes to fight back. I had to try to keep him down for most of the battle while using the Woocopter to defeat him. Battle 7: Hide-Out – Here you have to go through and fight all of the previous bosses again before confronting Famardy in this final stage. Lavicus actually gave me a hard time during that boss rush. Famardy cannot be grappled which is fine with me. His size alone is enough to hurt and trample any monsters that are in his way. When he's finally taken down he will break up into tiny pieces that you will then have to eliminate all of them before time runs out. Cyber Woo finally was able to escape the destruction and making Cyber Woo the King of ALL Monsters! THE END? (However there is no more sequels after this game sadly.) Thanks for watching! Hello again. It's been awhile since I've submitted a speedrun here on SDA. I've been sort of busy as of late balancing life and gaming while trying to work on some speedrunning projects on the side. Well here's a recent speedrun that I wanted to improve for awhile now and a tough one too. What is King of the Monsters 2? It is an arcade style beat'em up where 3 surviving monsters in the world come out to stop evil intruders from conquering the world. Why speedrun this game? I've always enjoy playing this game when I was young and at the time this game inspired me from remembering watching Godzilla on tv haha...Anyways through the years I learned alot about this game and I'm still learning more about it till this day. Now before I get into the speedrun. There are a few things I should note to help understand what goes on during this run. 1. Cyber-Woo is the strongest monster in the snes version. His Woo-Coopter Ability inflicts a good amount to enemy bosses while having decent duration time. You'll see me use it alot throughout the run. 2. The Boss AI I feel are RNG. While some bosses are predictable there are some that just respond to your controls and paces along with which makes it difficult to shake off and find any open opportunity to attack. This also means that the monster is trying to do a ranged attack. Some monsters tend to have these "i-frames" making my attacks useless and go through them when I get in contact with them which is a real bother sometimes. 3. Grappling or Locking Up with the Monsters are a big waste of time no matter what the outcome of it. Here I tried my best to avoid this situation since all it takes is to get into close contact with them. This is also the reason why I use Cyber-Woo. 4. Whenever I do a jumping attack. I can only perform those attacks while jumping left or right. I doesn't work jump straight up or in diagonal. I tend to do this attack often to knock down the bosses to buy me some time to charge up my power meter. 6. Did I mention Cyber-Woo is THE strongest monster? Haha I believe it should be it's own category...I just want to give the other monsters some love. Fun fact about me and this game...my favorite monster is actually Super Geon. Most of these stages are short so I won't go into too much detail about them. There are some sections in the game that I have to fight waves of enemies before I proceed over to the next screen. I don't know if it's possible to skip those screens or to get through it faster but I figure that its there to elongate the game since I believe they are "on a timer". - Eifflelyte is a push over. He has two forms. Sometimes RNG can play the part here too. - Clawhead is alittle tough. From his second knockdown he tends to counter-attack. Here I made an mistake by grappling with him but I didn't really lose time overall. - Beatlemaster is also random. Not only that he's aggressive in the fight but whenever he digs underground you lose time. By pure luck I manage to completely kill the boss without having to deal with its beatle form. - Sack Eyes is somewhat aggressive. Not only he tries to do counter-attacks but he also tries to jump towards you trying to force you into grappling with it. Well he was denied! - Lavicus is a very aggressive boss. He likes to fight back and sticks with you. Luckly in this run I had good RNG and saved alot of time in that segment. Saved about 47 seconds overall. - The Hide-Out stage is a Boss Rush before the final boss. In short, I had bad RNG in the Huge Frogger. I had one grapple with Beatlemaster and I had bad RNG with Sack Eyes and Lavicus. Here I lost 12 seconds in the boss rush segment but I was still ahead of my overall time by 35 seconds. - Famardy is a tough final boss. The only thing scary about him is when I jumps at you and around. Other than that it didn't really fight back and had okay RNG. However I did lose some time in that segment but whatever. I got a new record! To summarize, I had real good luck with some decent RNG in this speedrun and the time I've gotten will be tough to beat. Of course there are still improvements here and can bring down the time further. This is a fun little gem that people should try and get into casually or speedrunning. I would like to thank the speedrunning community and Speed Demos Archive for being awesome at what they do. I feel proud to be part of it and I will continue to support them in any way I can and keep enjoying playing these awesome video games. Follow me on Twitter @DeMoNFLiP84. Thanks for watching my speedrun and reading through this headache...haha.